After 12 months of construction, MAN Truck & Bus South Africa has moved into its new proprietary Parts Distribution Centre (PDC) in Germiston, Gauteng. The new facility, located just over 4km from the company’s Isando headquarters and O.R. Tambo International Airport, has been designed to house greater inventories of MAN and Volkswagen truck and bus spare parts and to expedite swifter speed-of-delivery to MAN Truck & Bus South Africa’s sub-Saharan customer base. The new flagship MAN Parts Distribution Centre, a Super Group facility designed and built by commercial property developer, Intaprop, is equipped with state-of-the-art technologies to meet growing market demand in the sub-equatorial African region. At a total investment of R180-million, the new Parts Distribution Centre is custom-built to MAN specifications and comprises 17 000 square meters of warehouse space with 1 000 square metres of office space. The warehouse will operate on MAN’˜s advanced parts platform system and features a new racking system, as well as a 1 600 square metre, three-level mezzanine area for smaller parts. 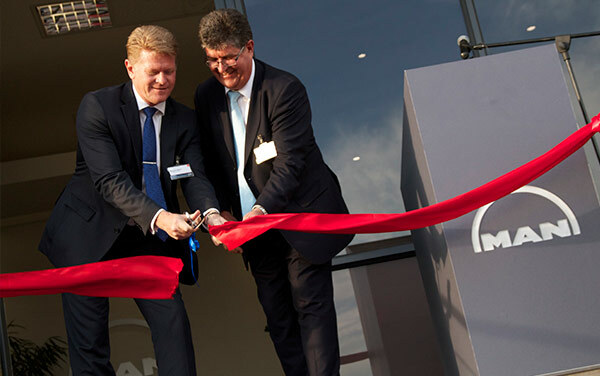 “The new facility has been designed to comfortably allow for future expansion of MAN Truck & Bus SA into the sub-Saharan region, particularly as MAN’s global strategy gains momentum with the introduction of new models. The new facility will also be geared to comprehensively support existing and forthcoming truck and bus derivatives from MAN and Volkswagen,’ says Geoff du Plessis, Executive Chairman, MAN Truck & Bus South Africa. “This PDC is fully integrated in MAN’s organisation IT systems, allowing stocks to be centrally scheduled, with MAN’s dealer network given full support in ensuring optimum parts availability for their customers,’ says Heinz-JÏ‹rgen LÃ¶w, Executive Board Member, Marketing, Sales & Services at MAN Truck & Bus AG. To limit its carbon footprint, the new building incorporates a specially-designed roof to allow as much natural light as possible into the warehouse. It is also fitted with special lighting and thermal insulation to reduce the building’s overall energy requirements. “With its close proximity to O.R. Tambo International Airport and state-of-the-art warehousing technologies, the new facility will enable our Central Parts Division to improve on its already impressive customer service delivery record by being able to fly in urgently needed parts from MAN’˜s international production centres and courier them to our customers with greater efficiency and speed, providing our Support Division with an enviable competitive advantage,’ concludes du Plessis. e-Tolls have begun – so What Now For Consumers? Introducing the new Kuzer and Quester. FleetWatch was launched in 1993 initially as a fleet risk management journal, and has since evolved into a trucking magazine covering all aspects of the trucking industry with the primary focus on the issues facing modern day truckers.